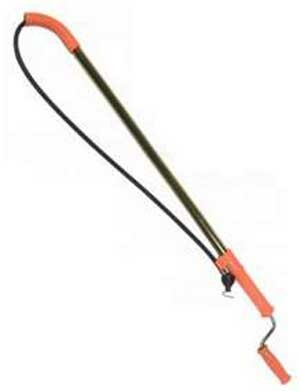 The ideal tool for breaking up stoppages or retrieving lost objects in clogged toilet bowls. Works where plungers fail. The patented Flexicore cable is made from two layers of spring wire wrapped tightly around a wire rope center. 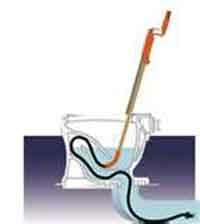 It resists kinking and breaking yet has the right flexibility to get through low flow toilets. The heavy-duty closet auger lets the operator clear stoppages beyond the bowl. No need to lift the bowl, because it has three extra feet of cable telescoped into a guide tube until you need it. After you've worked the first three feet into a bowl, you can go three feet farther simply by pressing a button and pulling out the crank handle. Both have a vinyl guard that protects the bowl against scratching, a large grip handle and turning handle for easy operation. The down head works like a universal joint, following the bowl contours while protecting inner bowl walls from chipping or breaking.